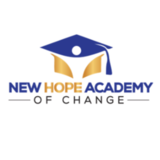 "On Time..." "On Task..." "On a Mission"
New Hope Academy Of Change has not yet activated their merchant account with Givsum. Your donation will go to the GIVSUM Foundation who will issue a check to New Hope Academy Of Change ( less applicable fees ) as a grant within 30 days. You will get a tax receipt for the full amount of your donation from the GIVSUM Foundation, which you may use for your tax purposes.